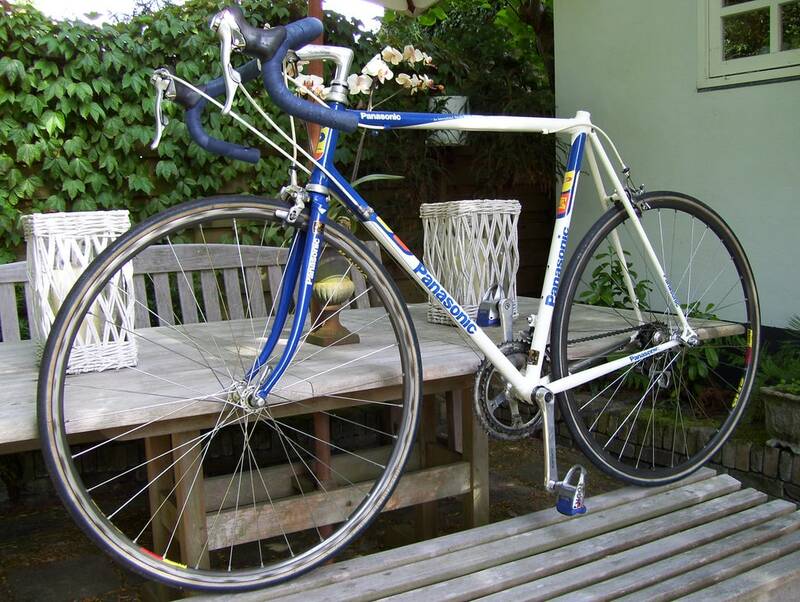 If you are a Panasonic bicycle collector (or any kind of bike collector for that matter) sooner or later there will come a time when you find a bicycle that you really wish to buy that will be in a far away location. If you are lucky, the bike is on eBay and already has a shipping option or perhaps it is being offered by a member of a collector forum and they know how to safely ship the bike. Today we’ll talk about the for sale listings that don’t offer shipping and typically only want to deal with people locally such as Craigslist. It’s perfect. The Panasonic bicycle you’ve wanted your entire life and even your dog wants it. Trouble is, you live in Portland, OR (mmmm Granola) and the bike happens to be in a small city in Ohio and the seller wants cash. Odds are that you don’t know anyone in the seller’s locale, so you’re going to have to get creative. Know what you are looking at and what you want. Just because the ad says the bike is a 1984 DX-6000, don’t assume that it is accurate without confirming it for yourself. (There were no DX-6000 bikes in 1984 for example.) You’ve figured out what the bike is and what the components are on the bike. We generally look for stock original or very close to original as possible, but perhaps that doesn’t matter as much to you. You should also have an idea what it is worth. Finally, don’t forget about fitment. Will the bike actually fit you? You should have an idea of all of this before buying unless it is strictly for your collection and you don’t care about size. Contact the seller. Yes, hello Captain Obvious, it is time to reach out and touch someone. If you want to blow your chances, go ahead and send an email (or call the seller) saying “Hey, I wanna buy your bike, will you ship to Portland?” Fail. Your words are important here. You need to sell yourself to the seller in a way that they know you are a legitimate buyer first of all, and secondly that you’ve got all of the logistics handled for them so it will be easy for them. How do you do that? Have your act together when you call or email and lay out the entire process for them. Offer to pay them up front via PayPal -and it doesn’t hurt to throw in a small bonus to show you’re serious assuming the bike isn’t grossly overpriced. Do your homework ahead of time! If you’ve had even half a clue in life, you learned this lesson in school. In most cases the ad listing tells you what town or city the bike is located in. Now use the power of the internet (ta-da!) to search for bicycle shops in the immediate area. Contact a couple of these shops and ask if they can safely/properly box a bicycle for you for shipping if the seller were to drop it off there for you. Don’t forget to ask about the cost for this service. In most cases I have found shops charge between $30 and $45 to do this. You may also inquire if the shop would be able to generate the shipping label for you as well. This would be the easiest route if you’re not already a UPS or FedEx account holder. The advantage of having an actual bike shop do the boxing and shipping for you is that they SHOULD know how to do it properly and should have access to the proper sized boxes to avoid over-size shipping fees. Most bicycle boxes are roughly 51″ long by 8″ wide by 28 inches tall. This works well for shipping and will keep you clear of the added fees. Add just an inch or two to any of those measurements and your shipping fees could literally double. This is something to keep in mind if you are shipping VERY large frames (say, larger than 60cm perhaps?) but in most cases you won’t need to supersize your box. Assuming you’ve done your homework and convinced the seller to sell you the bike even though you are not local it is time to celebrate. Pay the seller via PayPal (don’t send cash unless you’ve given yourself a lobotomy with a spoon in the past). You could do a check or money-order but if the seller turns out to be shady you have almost zero recourse. Once paid, have the seller drop off the bike for you at the bike shop you’ve prearranged to do the packaging and shipping. If they are doing it all, you just need to pay them and sit back and anxiously await the arrival of your bicycle. In some instances, sellers DO know how to box a bike or bike shops will box it but would rather not print shipping labels for you (rare). In this instance all you need are the dimensions of the box along with the weight along with a FedEx.com account. Log in and create a return shipment with a ground call tag and a friendly FedEx driver will pick up the boxed bicycle at the bike shop or seller’s location and nobody needs to print any shipping labels as the driver will have them on arrival. This works so well I use it almost every time I buy a bike remotely. Plan your budget. Factor the purchase price of the bike, the boxing fees, shipping fees (generally $55 – $105 in the U.S.) and a few extra dollars that you will likely need to spend once the bike arrives on maintenance items. You don’t want to wind up “upside down” in terms of investment-to-value unless it is your dream bike and you don’t care about the money. It goes without saying but be professional and be courteous. Don’t make us call your mother.